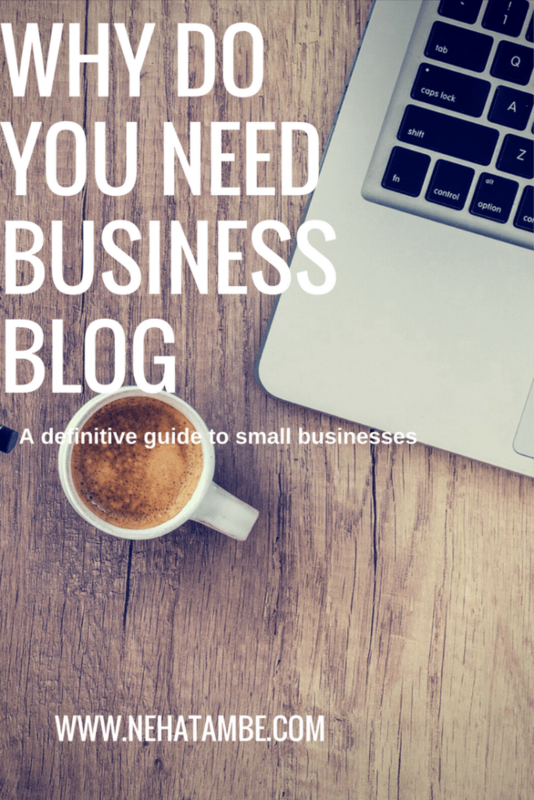 Blogging is one of the most important tools that a small business or personal brand can leverage for long term benefits in terms of brand awareness and brand identity. Have you observed how all big brands maintain a regular blog? It is basically a useful tool for every brand, big or small, however what works for small brands or personal brands as an added advantage is the ability of the blog to create a brand identity and awareness for the smaller companies. Now that you have defined your audience, you know who they are and what kind of information they are looking for. When you create a blog content plan, it needs to be created, keeping in mind your immediate and influenced audience. For eg:- If you are a baker, your immediate target audience is all those who love baked goods, but apart from that your influencing audience could include healthy bakes and shakes or maybe gluten free products. So create a list of your blog topics based on what this core audience group is looking for? What are their pain-points? What information are they seeking? As a small brand it is essential to blog as that will help you stay relevant and even top-of-mind. Small brands come up with new offerings and new outlooks at a much faster rate as compared to bigger brands. Use that to your advantage and talk about things that are new at your end. Talk about how you are embracing technology to get your work done faster. Talk about the way you finished a marathon bake for a 75th birthday celebration, while ensuring that your 7 am gym customers get their daily dose of healthy shakes and snacks. If you are doing something that most big brands do, you can boast about that too! All this and more will help you find your unique voice and be relevant to your audience. Just because you are a bakery, don’t drone on and on about why certain industry equipment is costly and how that is unfair, your audience might sympathize at first, but the bottom line is they don’t care or know. For them the end price and the quality is what matters. Brand Awareness is where people recognize that you are a player in a certain niche. So if you are an author, people see your name and recognize it or if you are a bakery, they recognize your logo. Blogging helps you put your best foot forward in terms of knowledge. If you want to establish yourself in a certain niche it is essential that you blog about that topic. Build your brand signals around that niche. You won’t see Robin Sharma talking about Yoga or Javed Akhtar talking about food. Everybody can have an opinion on everything, but that need not be shared on their blog. When you consistently blog about a certain topic, your readers come to recognize you as an authority in that niche and will look up to you for answers. Build conversations around your niche and help your audience with the best of knowledge and information. Apart from the brand value that a blog adds, it also helps in better rankings on Google! Google loves fresh content. A regularly updated blog is a source of fresh content and this keeps your website highly listable. In the eyes of Google, if you regularly and consistently share about certain topics, then it considers you an authority in your niche and pushes your blog/website up when there are searches in your domain. Apart from this as you raise as an authority in your domain, more and more bloggers and readers will link back to you as a source of information. This will help improve your backlinks, thereby improving link juice. This is an important aspect in listing your content as link backs and their authority will further improve your website’s Page Rank. Your audience will not read your blog and buy your product the first time they come to your site. This is not a direct conversion tool for most segments however this is an excellent soft sales tool. The idea of blogging is to be an authority and a ‘go to option’ when it comes to your specific field. Taking our example further, if your bakery blog is popular because you share interesting gluten free recipes, offer information about healthy substitutes and maybe videos of healthy cakes in the making, next time your customer is thinking about ordering a cake for his friend’s birthday, he is bound to visit your website for ordering it. Your regular posts have slotted you in his mind’s eye and that is what we are aiming for. Please do not assume that just because you are blogging, you will start getting an audience immediately. This is a steady process, but it is a powerful one and you should stay at it while running your business to ensure that you make the most of it. Also as the blog can be accessed world-wide, don’t stop just because you have a local business. A local business too can get all the above benefits and you sharing your blog in your local groups will yield you similar benefits. It is also very easy to quit blogging because you might not remain consistent or might not see any immediate spike in your visits. But remember only consistency is rewarded in blogging. Blogging and Brand Awareness go hand in hand for small businesses. As you do not have too many marketing tools at your disposal, it makes sense to invest more time and effort in a targeted few. While not all tools fit all niche, blogging is a universal tool that has offered results irrespective of segments. It is also a single tool that can act as your marketing, branding and conversion tool. This series is so informative. All knowledge and tips at one place. You have taken so much time and effort in compiling this. Kudos!! Thank you pratikshya,glad you found it useful. So much information ! Great ! I m surely going to follow all through April. Welcome Monika, glad you found it useful. Thanks Anshu! Glad you found it useful. Insightful post for both small and large business. Neha you’ve presented some really relevant and nifty ideas to help your blog get more awareness and visibility. I think all said and done, one needs to be patient too. Blogging for profit does not happen overnight. Very useful and relevant tips and insights. I agree with everything you have listed out, Neha. I think many people who start blogging fail to define their target audience beforehand. I don’t think they realize how important and critical this step is in the long-term. Also, like you mentioned, having patience is super important, most things don’t yield overnight results, and blogging is no exception. You have mentioned all the right reasons to blog and blog better. One should keep these in mind before blogging.